A few thoughts about the Rage and Rapture Tour, featuring Garbage and Blondie, that landed Friday at Mystic Lake Casino’s Showroom. What brilliant packaging. The bill made sense aesthetically, culturally and commercially. Having Exene Cervenka and John Doe from the great L.A. punk band X as an opening act was perfect. 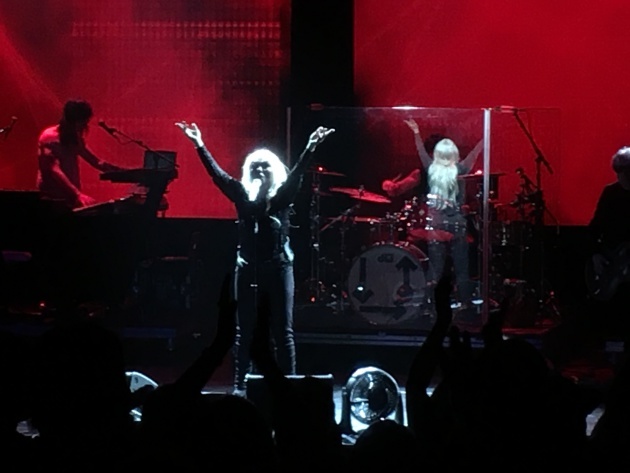 Blondie seamlessly mixed classics like “Call Me,” “Heart of Glass” and “Dreaming” with material from its new album, “Pollinator.” The new stuff including “Fun,” “Fragments” and “Long Time” sounded like vintage Blondie. Debbie Harry remains an irrepressible force. She arrived onstage sporting sparkly sunglasses, a cape emblazoned with “Stop [bleeping] our planet” and a wreath of oversized bees (plush toys) on her head. She preached freedom and bees. At 72, Harry showed the same ping-ponging girlish voice as ever. She didn’t dance much, usually just mock-dancing. Her personality and presence – and what she stands for her in terms of breaking down doors for female rockers – were worthy of multiple standing ovations. Harry mentioned how the band had gone on a tour of “Prince’s house” and that guitarist/cofounder Chris Stein would like to live there. Speaking of Minnesota musicians, Blondie also covered Bob Dylan’s “Rainy Day Women #12 and 35,” right after their own “Rapture” – one kinda rap song into another. Shirley Manson called Garbage a band of nerds. Is that because all the other members were wearing glasses? A fiery redhead in a long gold sequined gown, Manson, 50, brought a great sense of urgency to the stage. And it wasn’t just because she paraded around in circles for much of the band’s 75-minute set. With all those dark, moody songs and dissonant guitar, the pacing of Garbage’s set was odd – especially since the band saved its four biggest songs from the 1990s including “Stupid Girl” and “Only Happy When It Rains” for the end of their encore-less set. Playing stripped down with just voices and one acoustic guitar, X principals Cervenka and Doe proved that it’s about songs and the emotion of your voices not just about the noise.